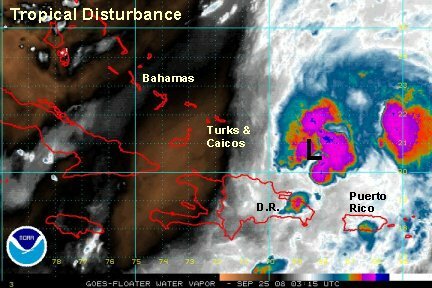 A large mass of showers and storms has developed in association with an upper level trough in the eastern Caribbean Sea. The trough appears to be weakening which would allow for more favorable winds aloft for development. A surface low or mid level low appears to have developed on the visible satellite imagery. Quickscat satellite imagery has not confirmed the surface low yet. Numerous showers and storms cover the Lesser Antilles. Interests in the western and central Caribbean should monitor the progress of this disturbance. Last edited by Caribbean Traveler on Thu Sep 25, 2008 3:38 pm, edited 6 times in total. The weak surface low in the eastern Caribbean Sea doesn't look as organized today. There is still a large mass of heavy showers and storms over the Lesser Antillies again. These showers and storms are in a very diffluent flow east of an upper air trough. Interests in the western and central Caribbean should follow this disturbance for any further development over the next few days. 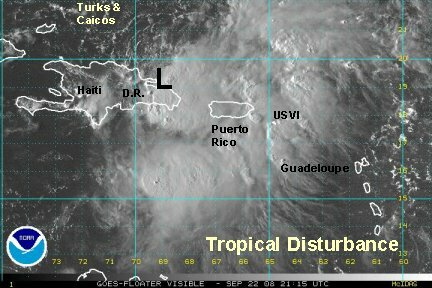 Satellite imagery and radar indicate that the tropical disturbance has become much better organized this morning and is on the verge of becoming the next Atlantic tropical depression. Radar indicates a spin about 100 miles south of Puerto Rico. A recon will investigate early this afternoon and we will know if it is a surface or mid level circuatlion at this point. The forecast models show this system lifting over the Dominican Republic and Puerto Rico over the next few days. Flash flooding is already occuring in southeastern Puerto Rico. Interests in the northern Caribbean should follow this disturbance carefully. Heavy rain continues to bring flash flooding to the eastern part of Puerto Rico and the Virgin Islands. Heavy rain in excess of 8" has been extimated near the southeast coast of Puerto Rico. No doubt this amount or more has fallen in El Junque. The Hurricane Hunter did find winds of 30-35 mph. 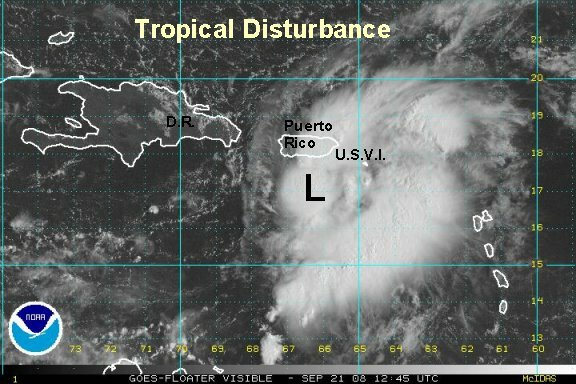 We expect that the disturbance will be classified as the next tropical depression with 12 hours as it moves offshore of northern Puerto Rico. The forecast models take it generally northward, east of the Turks and Caicos and west of Bermuda. Some models suggest that it may turn northwest toward the Mid-Atlantic. This is due to the scenario of a building mid latitude ridge over New England that would force it in this direction by late this week. Heavy rain continues over Puerto Rico with flash flood warnings for all areas except the northwest corner. For some reason the National Weather Service reset their doppler, so we don't have a good estimate. San Juan had a 24 hour rainfall total of nearly 4". There most likely have been totals in the range of 10-20" in the more mountainous regions. 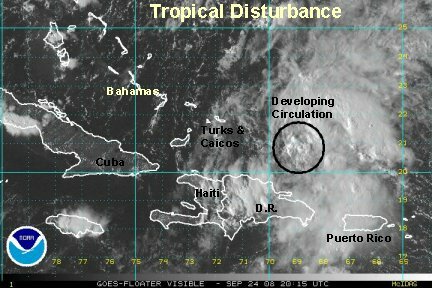 The disturbance is on the verge of becoming a tropical depression. Quikscat satellite now has a weak surface circulation over the Mona passage, inbetween the Dominican Republic and Puerto Rico. The mass of heavy rain is becoming more concentrated, but an upper air trough is introducing shear to the west of the low. You can see by our Tropicast, that the low is near the edge of the convection. Forecast models continue to bring this system northward this week. It should be near the Mid-Atlantic coast by Saturday. Some models are now farther east, keeping it offshore and moving it to Nova Scotia by Sunday. Rough surf on the Mid-Atlantic coast can be expected from another subtropical system, then this one later in the week. A weak surface low in near or a little offshore of the northeast coast of the Dominican Republic. Wiinds aloft are still not favorable for development, as a trough of low pressure is just west of the circulation. It is producing westerly wind shear, so the deep convection is mostly east of the circulation. Winds aloft should become more favorable for development in the next couple of days. The forecast models take the disturbance and develops it as it moves north of the Turks and Caicos. The models still take it near or offshore of the Northeastern U.S. by Saturday. It appears that a surface low is finally trying to organize somewhere near the eastern tip of the Dominican Republic. 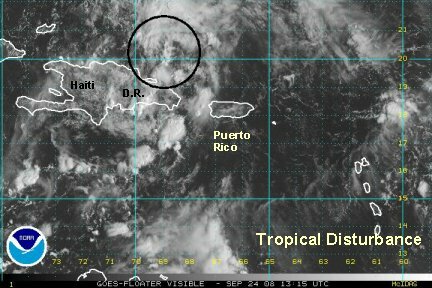 Yesterday, a weak low tried to form northeast of the Dominican Republic, but that attempt failed. Upper level winds are becoming more favorable for development as a trough to the west is moving farther west away from the disturbance. Radar imagery shows that the rain has ended for Puerto Rico and the U.S.V.I.. It is still possible that scattered, locally heavy showers will redevelop with the afternoon heating. Forecast models continue to take it northward over the next several days and have it in the vicinity of the Northeast coast by Saturday. At this time the models have too much of a spread to say if it will make landfall in New England or pass to the east offshore. We will have to watch for any interactions with another low pressure center forming off of the Southeast U.S. coast. Both of these systems will keep surf rough and rip currents strong. Beach erosion can be expected as well. Interests in Puerto Rico, Hispaniola, southeastern Bahamas, Turks and Caicos, as well as the Northeast U.S. should follow this system closely. Has the next Tropical Depression formed? Unofficially, we believe that the disturbance has now become the next tropical depression. Visible satellite imagery shows that a low level circulation has developed just off of the southeast coast of the Dominican Republic. NHC may upgrade at the next advisory. 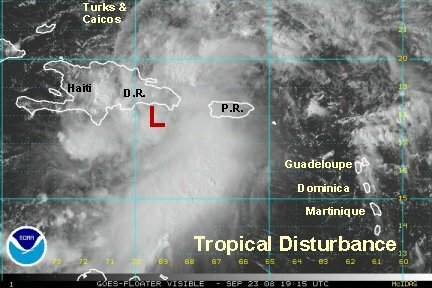 The "disturbance" should move northward or northwestward over the Dominican Republic. The land may temporarily stifle organization for about 12-24 hours until it crosses into the Atlantic. NHC may wait until it crosses over to the north side of the coast to classify it. Thankfully, most models are now shifting farther east. Most take it straight north. The southeastern upper air trough lifts out faster, allowing the upper high to move more east. This scenario would allow for northward track to near Nova Scotia by the weekend. Earlier models had the high off of the Northeast coast late in the week steering the tropical system into New England. Shortly after the disturbance was getting organized late Tuesday, it moved inland. This has stopped development. 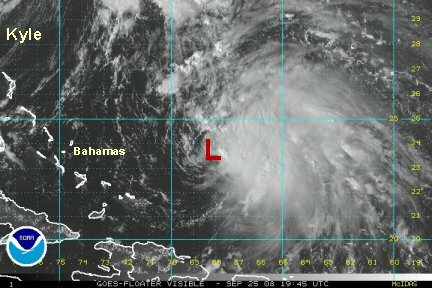 The Hurricane Hunters weren't able to find a significant surface low Tuesday afternoon. So, to sum up - the disturbance was on the verge of becoming a depression Tuesday evening until it moved ashore. It is very slowly moving northward and should move off of the northeast coast of the Dominican Republic during Wednesday. It should officially become the next depression unless NHC decides to classify the developing subtropical system off of the N.C. coast first. Still look for heavy rains bringing flash flooding and mudslides to Hispaniola. Scattered heavy showers will continue eastward into Puerto Rico and Virgin Islands. The forecast track has not changed much except for the timing. With the system taking a longer time to form it now should arrive near New England late Saturday and into Sunday. It is still too early to tell if a landfall is to be expected. In either case, heavy rain, beach erosion and gusty winds can be expected near the coast. 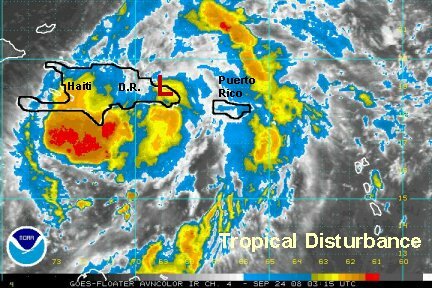 The disturbance's 18 hour stay over the eastern Dominican Republic has damaged the circulation that was trying to form. 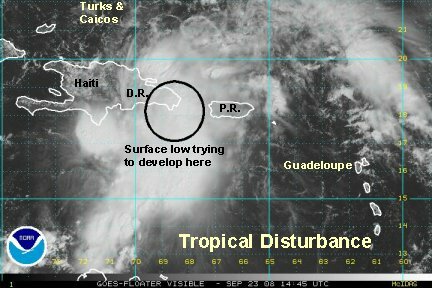 In fact, it is in pretty sorry looking shape at this time about 100 miles north of the Dominican Republic. The upper air high also collapsed that was over it and has been replaced with westerlies. The convection needs to be watched today to see if it makes a comeback. The models strengthen it, but at a slower pace now. The window of opportunity certainly was there yesterday for this disturbance to take off. The forecast track still shows a large spread as the system moves north of the latitude of Bermuda. Right now, it is forecast to move west of Bermuda, and near the New England coast by later Satuday into Sunday. Heavy rain, beach erosion and gusty winds can be expected near the New England coast. Deep convection is starting to build north of the reorganizing center of circulation north of the Dominican Republic. Another band of very heavy rain is in the Mona Passage just west of Puerto Rico. This will likely spread flash flood conditions back over the western part of Puerto Rico. Look for a slow methodical return of the system. Satellite imagery shows that the system is slowly gaining more convection. It is still apparent that winds aloft are still blowing from the southwest creating some shear. It is expected that we'll see a slow strengthening trend into Thursday. 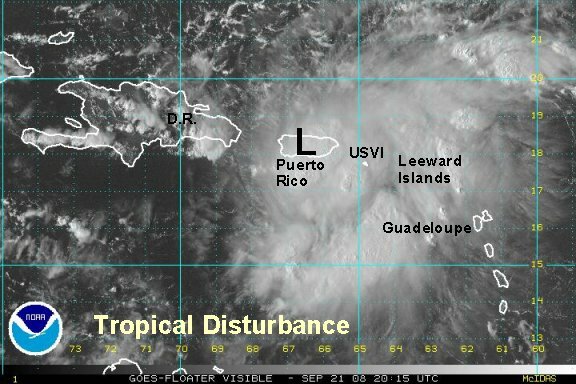 There is still a good chance that this disturbance will organize. Satellite imagery shows that deep convection is building near the center of circulation. Winds aloft are also becoming more favorable for development. 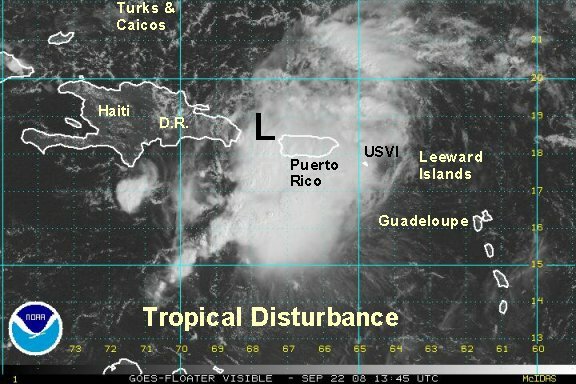 It appears that with the land masses out of the way, this disturbance will now organize. It will probably develop into a tropical storm during the next 24 hours. The forecast track still shows a large spread as the system moves north of the latitude of Bermuda. The forecast calls for the system to move west of Bermuda, and near the New England coast by later Satuday into Sunday. It could come very close to Cape Cod. Heavy rain, beach erosion and gusty winds can be expected near the New England coast. We think that NHC has reached their quota for naming storms this year and have decided not to name any more. The quickscat microwave shows 50 knot winds on the east side of the cloud complex. It also shows that a weak surface low has developed. Some westerly shear has exposed the low center on the west side of the circulation. So, yes we think that this qualifies as a depression again, even if it is struggling some right now. We look for continued development as it heads north. Bermuda may get clipped by the rain and wind as it passes by to the west Friday. NHC decided to name Kyle for the 5 pm edt advisory. Satellite imagery has not changed appreciably since our last update. 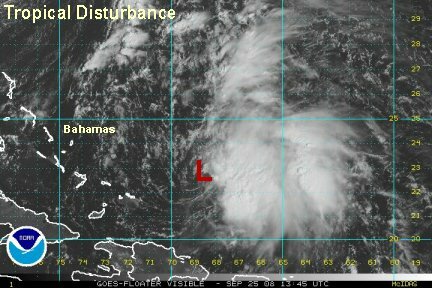 As of 5 pm edt, Kyle is centered at 23.5 N / 68.3 W or about 645 miles ssw of Bermuda. Top sustained wind are at 45 mph. The Hurricane Hunters found a minimum pressure of 1001 mb. Kyle will likely strengthen and may become a hurricane in the next 24-36 hours. At this time, it is still facing some westerly shear. This shear should weaken and allow strengthening. Kyle will pass west of Bermuda Friday night and Saturday. It should pass close enough to bring rain, gusty winds and increasing surf on the southern shore. It will then pass east of Cape Cod Saturday night into Sunday. Kyle may be a hurricane at this point and bring similar effects to coastal New England. Models generally pass Kyle about 100 miles east of Cape Cod and have it making landfall Sunday in Nova Scotia.